After its pilot in Bangalore, Uber has started yet another pilot in Delhi NCR for its much awaited Uber Ride Pass. On the face of it, this looks like a replica of Ola Select. But take a second look and it looks an adapted version of the Ola offer. There are two variations of the Uber Ride Pass which have been introduced by the company; UberGO and UberPREMIER. UberGO: This variant has Rs.89/- as flat fare for an upfront fare capped at Rs. 180/-. Any amount over the Rs.180 cap will have to be borne by the user. If your ride’s fare is lower than the base fare, the lower fare will be charged. This looks simple enough. But going through the FAQs and Terms and Conditions, we have come across some points that we feel you must know about this new feature. This offer is currently available to select users only. If you are heavy Uber user, you are less likely to get this offer for yourself. Uber says that, if your ride fare is less than the flat amount, then you will be charged with the lesser amount. But Uber does not clarify whether it will be counted as a Pass ride. This offer does not work with CASH or DEBIT CARD. It only works when you make payment through PAYTM. Flat fare will not be applicable if you take a detour or change destination after booking the trip. Waiting charge is still applicable and it will be charged over and beyond the flat Pass fare. You cannot buy a new pass until your existing pass expires. Refunds are not available with Uber Ride Pass. In case of any cancellations or problems with your trip, you will probably not get any refund. So, check your Uber app to see whether you are eligible for this offer. If you have already tried it, share your experience and recommendation with us. 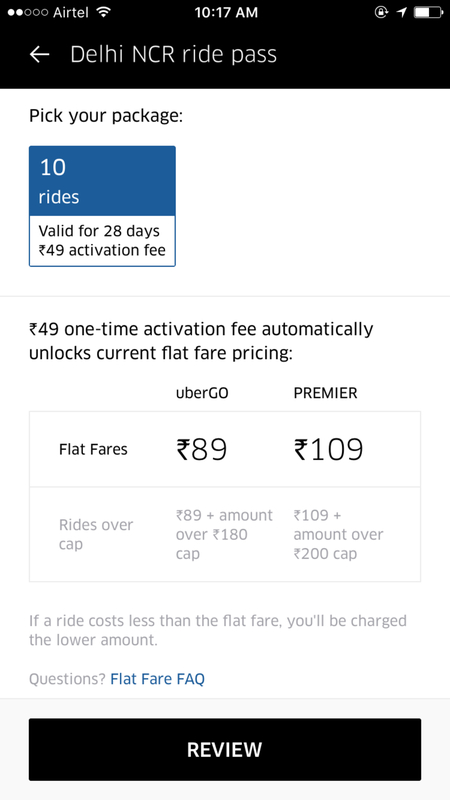 "Uber Ride Pass Arrives in Delhi at Rs.49/- only! 8 Things You Must Know", 5 out of 5 based on 3 ratings.